THE UNITED STATES has said there is “no basis” to ground Boeing 737 MAX airplanes, after a second deadly crash involving the model in less than five months prompted governments worldwide to ban the aircraft. 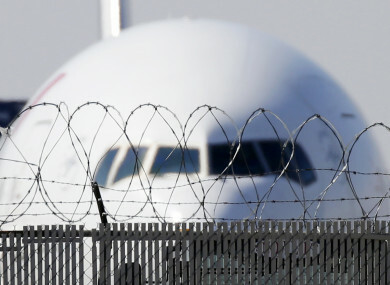 Despite the aviation giant’s assurances that the plane is safe and reliable, Ireland and the rest of the European Union have joined India, China and other countries grounding the plane or banning it from their airspace as they await the results of the investigation into the crash. “Thus far, our review shows no systemic performance issues and provides no basis to order grounding the aircraft,” Federal Aviation Administration (FAA) chief Daniel Elwell said in a statement last night. The widening actions against the aircraft puts pressure on Boeing – the world’s biggest plane manufacturer – to prove the MAX planes are safe, and the company has said it is rolling out flight software updates by April that could address issues with a faulty sensor. The Irish Aviation Authority’s (IAA) took steps yesterday afternoon to temporarily suspend the operation of all variants of the Boeing aircraft into and out of Irish airspace. “This decision has been taken based on ensuring the continued safety of passengers and flight crew, which is the IAA’s number one priority,” the IAA said. The suspension took effect from 3pm yesterday and followed an announcement by the UK’s Civil Aviation Authority that it was banning these aircraft from its airspace. A Norwegian flight to Newburgh, Orange County, New York – due to leave Dublin Airport at 3.20pm yesterday – was been cancelled. Earlier today the airline said it was grounding its Boeing 737 Max fleet. An earlier 2.55pm flight to Providence was also cancelled. A spokesperson for the airline said it is looking at re-allocating passengers on other Norwegian flights and it is currently in the process of offering re-bookings to affected passengers. New Zealand has also temporarily banned the aircraft from its airspace, along with Australia, Malaysia, Oman and Singapore. Turkish Airlines, one of the largest carriers in the world, said it was suspending use of its 12 MAX aircraft from today, until “uncertainty” was clarified. Email “US says 'no basis' to ban Boeing 737 Max jets despite Ireland and rest of EU grounding planes”. Feedback on “US says 'no basis' to ban Boeing 737 Max jets despite Ireland and rest of EU grounding planes”.